Amazon is expanding its physical presence again, this time opening a 4,000-square-foot store that sells a wide range of products, including shower curtains, Hallmark cards and baby bottles. NEW YORK (AP) — Amazon is expanding its physical presence again, this time opening a 4,000-square-foot store that sells a wide range of products, including shower curtains, Hallmark cards and baby bottles. The store, called Amazon 4-star, opened Thursday in New York’s SoHo neighborhood and will only offer Amazon.com’s best-selling items or those that get four or more star ratings on its website. The products it sells can be changed out weekly, based on changing customer reviews or what is or isn’t selling well, said Cameron Janes, who oversees Amazon’s physical stores. The new store is another sign that Amazon is serious about expanding its brick-and-mortar presence. It already has more than a dozen bookstores around the country, recently opened four cashier-less convenience stores and bought the Whole Foods grocery chain a year ago. Like at its bookstores, 4-star doesn’t accept cash. Shoppers can pay with the Amazon app, an Amazon gift card or a debit or credit card. Prime members will pay the same price as it is on Amazon.com; non-members will pay the list price. Digital price tags will display both prices and will be updated in real time, Janes said. Items can’t be ordered online and picked up at the store, but 4-star will take some returns for items bought on Amazon.com. 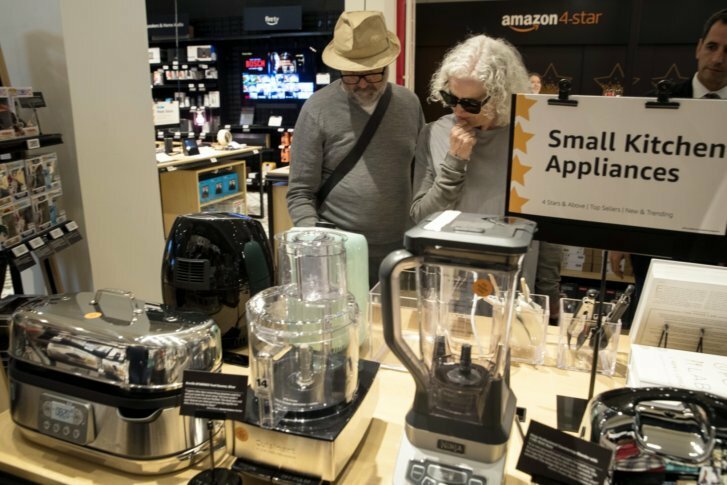 The store also sells toys, books and many of Amazon’s own goods, like its Echo voice-activated devices, AmazonBasics skillets and throws from Rivet, its homegoods and furniture line. Amazon said the store is permanent, but Janes wouldn’t say if more stores are on the way. “You’re going to have to stay tuned for what comes next,” he said.